Oh yes I would buy these again. The glass jar sets are so beautiful and useful. 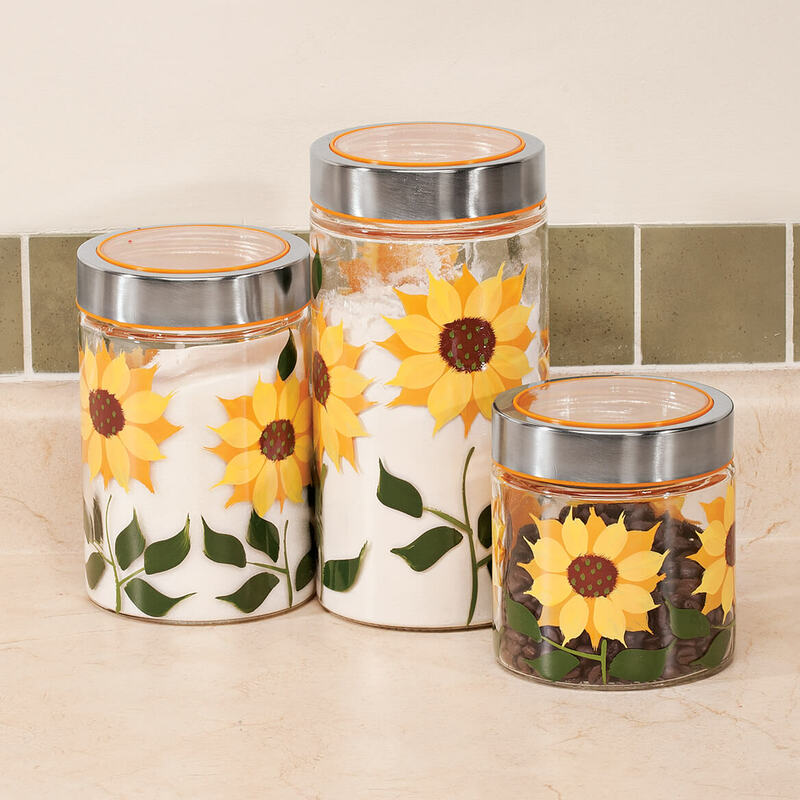 Sunflowers help to decorate my ladybug kitchen. Match perfectly with the sunflower rugs I purchased from you as well! They take up less room than the traditional canister! 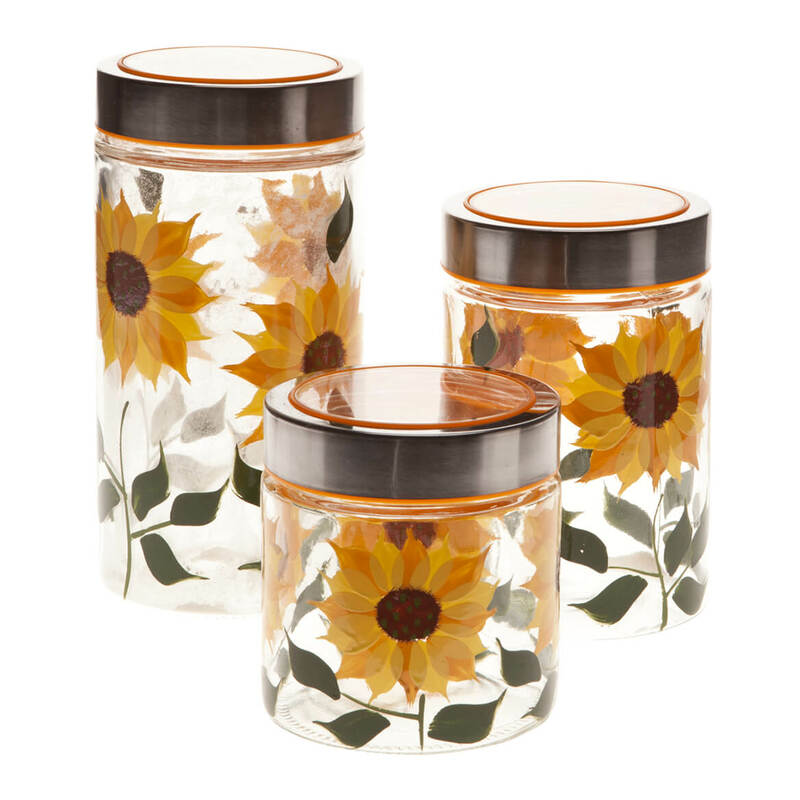 I love sunflowers and this item matches my kitchen design. The person giving these to likes Sunflowers. My kitchen is all sunflowers. A mother friend is from Kansas, where the state flower is the sunflower. I think the would be useful and beautiful for so many other things in your kitchen than just for canisters. I'm hoping.for other designs to come. I wanted to buy just one of it is it possible? BEST ANSWER: I think asking the maker or supplier of the canisters would be who you should ask. There would be a way to get only one canister, possibly dropping the box they come in and having only one to survive the fall. They are very nice I wish they had come in sets of four. They look great in my daughter's kitchen. Sorry I couldn't help more. Thank you for your question. We only have it sold and packaged as a set of 3. We hope this information will be of help to you. Can we buy additional Jars for the Canister Set? BEST ANSWER: Thank you for your question. We do not carry any additional sets of canisters. We hope this information will be of help to you.